Thomas also claimed baby Jacob was taken by gunmen who allegedly stormed his home at about 12.30 pm on Tuesday, looking for a gun that they said he was hiding. Police reports stated when Thomas denied knowing what the men were talking about, the assailants ordered the father of two to slit his own wrist with a knife. They then allegedly dealt him several blows to his head, before picking up his son. The assailants then ordered Thomas to drink a quantity of pitch oil, before ordering him to, “get the gun”, or face the consequences. The intruders reportedly left Thomas’ home taking baby Jacob with them. Thomas eventually made his way to the Eric Williams Medical Sciences Complex and up to late yesterday was said to be in a stable condition. Police visited Thomas’ home yesterday afternoon with the intention of using sniffer dogs to see if they could locate baby Jacob or at the very least the scent of the men who allegedly raided the child’s father’s house. They were met by Thomas’ relatives who lived nearby. The relatives allowed police officers to enter Thomas’ home which at the time was empty. However, yesterday when this country joined the world in observing Universal Children’s Day, police during a preliminary check of the premises, found baby Jacob’s body stuffed in a purple cloth sack in the cesspit at the back of the house. The officers notified their superiors and a party of officers from the Homicide Investigations Bureau and the Northern Division including Inspector Mark Maharaj, Sgt Vetus Hernandez, Sgt Pinder, Sgt Singh, Cpl Jones, PC Grant and others, visited the scene. Thomas’ relatives were seen weeping after they were told of the discovery of Jacob’s body by the police. Screams of, “oh Lord, why Lord!” were heard while two women who were outside Thomas’ house had to be escorted to their neighbouring homes. The area was then cordoned off as Crime Scene Investigators and a District Medical Officer visited the scene. As time passed, other persons in the quiet, close-knit community learnt the horrifying news that the child’s body was found in the cesspit and several persons came out to see what was going on. “Who could do this to a child? That is an innocent. He wouldn’t have done anything to his killer. Why would anyone want to harm a child? Monsters! Those kind of people are just monsters! Hold them! Deal with them,” a male resident cried. At about 3.30 pm, baby Jacob’s mother Cherisse Munroe arrived at the scene. However, the 20- year-old woman was too distraught to speak to members of the media as she was led away weeping by officers to be interviewed. Baby Jacob’s body was later removed to the Forensic Science Centre, St James where an autopsy is expected to be done today to determine how the child died. Officers said they are looking at “several leads” as they continued their investigations into the tragedy. “The Express was on the scene yesterday and witnessed one of the detectives telling his colleagues he found the man’s story “funny” and, fearing the worst, the first thing he opted to do was check the outhouse. 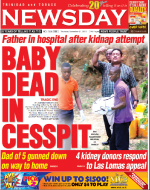 The community of Maracas, St Joseph, was left bewildered and in mourning yesterday, after one-year-old Jacob Munroe, who was reported kidnapped on Tuesday, was found wrapped in a purple sheet in a cesspit close to where he was allegedly snatched by three men. Residents could not believe that a baby who had all his life before him could be killed in such a brutal way by his alleged abductors. According to police reports, around 12.30 pm on Tuesday, Jacob’s father, Allan Thomas, was at his Santarita Trace, Lluengo Village, Maracas, St Joseph, home when three armed men entered and demanded that Thomas hand over a gun he was hiding for someone. After Thomas refused, the men are alleged to have ordered Thomas to slit his own wrist and drink a flammable substance believed to be pitch oil. The men then grabbed the child and fled the home. Relatives contacted police and an ambulance, which arrived shortly afterwards and took Thomas to the Eric Williams Medical Sciences Complex in Mt Hope. Police then started a manhunt for the kidnappers and little Jacob. Yesterday, however, around 1.30 pm, the gruesome discovery was made. Police visited the area where Thomas lives to gather more information from relatives and neighbours, as well as forensic evidence after they discovered the body so close to the family’s home. Around 4 pm, the child’s 20-year-old mother, Sharisse Munroe, arrived on the scene in a police vehicle with her sister. The mother arrived just in time to see her only child’s body being carried away in a hearse. Grieving relatives said the child was taken to visit his father on Sunday so that the two could have bonded. Residents of the area expressed shock and disgust over the find. Many vowed that if Jacob was their child “somebody would ah dead too.” Most of those gathered around the crime scene were young men who said they too were fathers and could not imagine who or why anyone would want to hurt an innocent child. Police say they are investigating the kidnapping while exploring other leads into the death of the child. Thomas’s relatives, who live several feet up an incline from where he lives, were seen hugging each other and crying. A post-mortem will be done on Jacob’s body today at the Forensic Science Centre in St James to determine a cause of death. Thomas, a taxi driver, was still warded at the EWMSC under police guard up to last night. In an unrelated matter, police are also investigating the alleged kidnapping of 16-year-old Kefa Forbes, who was snatched at Library Corner, San Fernando, on Monday. Forbes, a student of the San Fernando East Secondary School, was eventually released in Point Fortin around noon yesterday. According to her 50-year-old mother, Jennifer Williams, Kefa was returning home around 9 am on Monday, after running errands at JTA Supermarket at Carlton Centre, when she boarded a taxi. However, she was allegedly abducted by the vehicle’s occupants. Speaking at her Pleasantville home yesterday, Williams, a mother of seven who had her left leg amputated because of diabetes in 2009, said that on Tuesday, she got a call from the kidnappers asking for a $5,000 ransom or else they would hurt her daughter. Williams said hours later her daughter called and told her she had been kidnapped by a girl and two Rastafarian man, and that she was taken to a house in north Trinidad where they locked her in a room. She said Kefa reported that she was not sexually assaulted but was slapped around several times. “When the kidnapper called me, I told him I only have one leg, I am a disabled person and I live on disability grants. I asked him, ‘where will I get that money?’” Williams said. Williams said she knew she could not raise the money so she called Kefa’s phone yesterday and threatened the kidnappers, saying she knew people who would hunt them down. She said they eventually released Kefa and she was picked up by a taxi driver and taken to the Point Fortin Police Station. One-year-old baby Jacob Munroe died of massive head injuries and his body was dumped in a cesspit behind his home after he was killed. This was the result of an autopsy on his body at the Forensic Science Centre, St James, yesterday morning. The post mortem was performed by forensic pathologist Dr Hughvon des Vignes, who also found the toddler had been smothered. Des Vignes’ report also revealed there were bruises to his buttocks, indicating he was beaten before being killed. He, however, did not find any evidence that the child was sexually assaulted. Munroe’s autopsy was delayed after his father and mother’s relatives, who came to the centre to identify his body and witness the procedure, had a small disagreement. Munroe’s grandparents on his father’s side arrived at the centre early yesterday and identified the child’s body. When the child’s mother and her relatives arrived hours later, staff at the centre informed them they could no longer view his body. “You should have reached here at 9 am. The next time you will see the baby is at the funeral,” an unidentified staff member said to Jacob’s mother, Cherisse Munroe, who quickly burst into tears. “How you could do that. I can’t even see my baby,” the child’s mother said to her in-laws as she stormed out of the building in tears. Both sets of relatives then engaged in a heated discourse which only ended after funeral home staff intervened. DIRECTOR of Public Prosecutions (DPP) Roger Gaspard yesterday gave instructions to police to lay a charge of murder against a 27-year-old Maracas/St Joseph man for the murder of his (the man) one-year-old son, Jacob Munroe. The child’s tiny body, wrapped in a piece of cloth, was found inside a cesspit at the back of his home on November 20. It was reported to police that Jacob’s father was at home on November 19 when three men visited him and demanded he hand over a gun. The father also claimed that the men then forced him to drink kerosene and slit his wrist. The police were also told that the men then grabbed baby Jacob and fled the scene. Police carried out extensive enquiries which led them to the back of baby Jacob’s home where they found his body inside the cesspit. ALLAN THOMAS kept his head bowed yesterday as he stood before a Tunapuna magistrate to answer to two criminal charges namely, murdering his own son, one-year-old Jacob Monroe and attempting to take his (Thomas’) own life. It was a rather low-keyed affair — Thomas’ appearance in court — for his alleged role in a crime i.e the murder of baby Jacob, which shook the nation within the past month. The 27-year-old was brought to the court handcuffed, escorted by two policemen, with his left wrist wrapped in bandage. At about eight-thirty, yesterday morning, Thomas was taken from the Tunapuna Police Station and placed into a police vehicle which drove him to the nearby Tunapuna Magistrates’ Court. As he was brought out, the 27-year-old man made no attempt to hide his face from media personnel gathered outside the court and some of whom arrived as early as 7 am.